During walkabout this morning, a small group of learners were working in a writing station. The directions were to make a shape from the conversation hearts in a bucket and then use the words in the shape to form a concrete poem. While this may sound easy enough, problem solving was involved since some words or phrases did not exactly lend themselves to the final product. You can bet it made for some HEARTy conversations indeed! 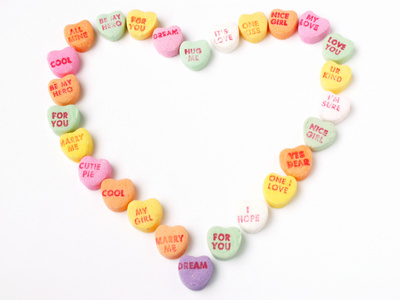 This entry was posted in Personal Reflections and tagged concrete poem, conversation hearts. Bookmark the permalink.